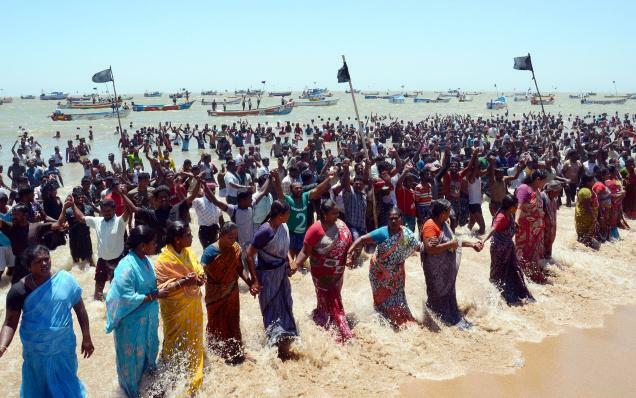 Despite the killing of an anti-nuclear protester by police on Monday, hundreds of protesters forming a human chain stood in sea waters today, for the second day in a row, demanding a halt to preparations for fuel loading into the reactor of Kudankulam Nuclear Power Project (KKNPP) in Tuticorin district. The Hindu.com reported that women and men would stand in the sea waters for two hours in turns. Pushparayan, leader of the People’s Movement Against Nuclear Energy (PMANE) has been spearheading the year-long agitation. Taking cue from a similar protest demanding land as compensation and reduction of Omkareshwar Dam recently by villagers of Khandwa district in Madhya Pradesh, PMANE launched their jal satyagraha (water civil disobedience) on Thursday, marking a new turn in their agitation, which was intensified after preparations for fuel loading into the plant was announced. More than 4,000 police personnel, bolstered by the paramilitary Rapid Action Force, continued to maintain a strict vigil, having almost sealed the entire Kudankulam town. Meanwhile, police have been seeking to arrest S.P. Udayakumar, the convener of PMANE, in attempt to quell the protests. They have already arrested a close associate of Udayakumar in Chennai last week for trying to “instigate” the fishermen to join the stir against Nuclear Power Project. Mr. Udayakumar had allegedly announced that he would surrender on Tuesday night, but seems to have changed his mind. Police said they would continue their search. Earlier this week, state officials say Indian police fired at protesters near this nuclear power plant being constructed in southern India, killing one person. The Tamil Nadu state government says police fired Monday to disperse about 2,000 people who were demonstrating against the loading of nuclear fuel in the Russian-built reactor. It says the protesters threw stones and sticks at police near the Kudankulam Project, and five officers were injured. Construction of the plant has been delayed by protests in the past year by residents and anti-nuclear groups concerned about safety following the Fukushima nuclear power plant disaster in Japan last year. The government says the plant, about 700 kilometers (440 miles) south of Chennai, the state capital, will meet safety standards.